I have been asked by Daniel C some awkward questions about the different types of headlamps fitted to the Opel Manta A series and to be honest I didn't want the hassle of writing a full explanation. But hopefully by writing this out once, I can simply point people to it in future. My experience is solely based on the models of Opel Manta A series available here in the UK. Bear in mind that Opel may have done things differently for models sold in Europe, the USA, or even South Africa for that matter. One constant is that the outer headlamps (nearest to the kerb) are used for the side lights and dipped beam mode and the inner headlamps (nearest to the Blitz badge) work exclusively for high beam mode. When in high beam mode the dipped beam lamps and side lights remain lit too. The outer headlamps (dipped beam) have versions to suit either left or right hand drive. As far as I am aware, the inner headlamps are universal and there is no difference between left or right hand drive specifications. A lot of cars from the 1960s right through to the 1990s used these simple 5 ¾" style headlights. In my opinion they gave a very accurate beam pattern and sufficient illumination for the performance of the vehicles they were fitted to and relative to the speeds they can be expected to attain. In some respects they are much better than modern units, which are much more expensive, difficult to adjust and have issues such a polycarbonate becoming fogged and scratched. However the internal reflectors are prone to rusting, this process is accelerated if you don't use the correct rubber sealing caps and clips as per the original specification. Don't worry I still have a few left. 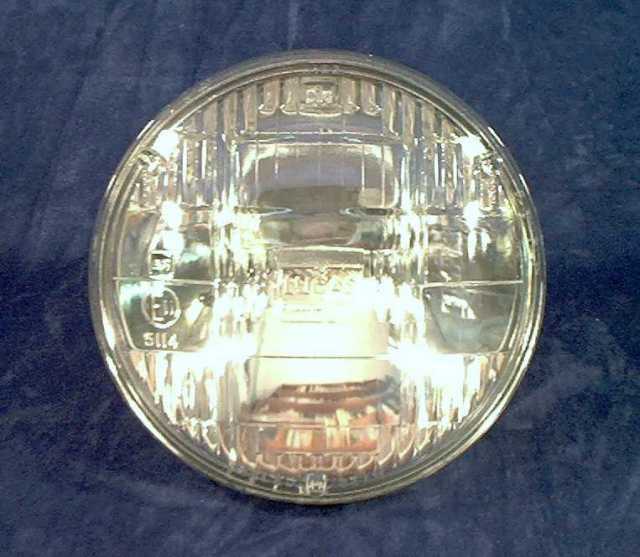 I have seen two different types of headlamp fitted to the Opel Manta A series and they are easily recognisable by the type of lamp fitted to the reflector unit and the electrical connectors installed in the wiring loom. The most basic models, branded as deluxe and often fitted with the 1.6s engine, were fitted with the H4 style of lamp, usually a Halogen unit, but occasionally on some early vehicles a Tungsden unit. There is interchangeability between the two, they fit the same size apperture and use the same multipin electrical connector. The Tungsden lamp is lower powered and casts a more yellow coloured light, so for this reason many will upgrade to the Halogen lamp for better night vision. The H4 is a twin filament lamp, designed so that a single lamp unit can provide both dipped and high beam in a single reflector. In theory with a bit of rewiring you could create an Opel Manta A series with a 2 lamp front grill, although that would be plain wrong. These were sold to be the top of the range variants and were fitted with what was considered to be the best components. The H1 lamp unit is quite small physically and produces a very accurate beam pattern on the dipped setting, otherwise I don't believe there is that much difference. The elctrical connections are descrete, i.e. 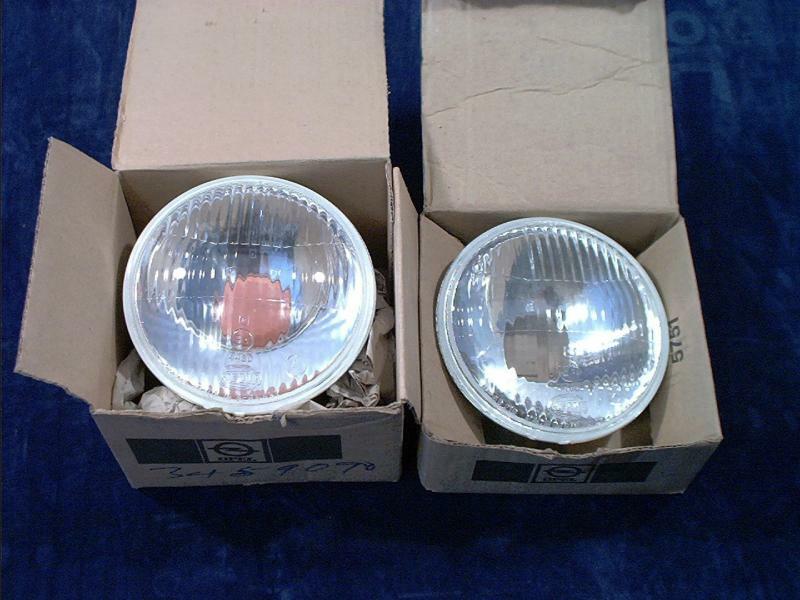 there is a lead for the main lamp, sidelight lamp and earth/ground/chassis. The original lamps used a round slip ring connector for earthing which slid over an alloy post. It is quite a shabby bit of design, the ring works loose and you get an electrochemical reaction between the alloy post and copper slip ring. Most replacement reflectors will come with a copper spade connector, you will need to cut the slip ring off the wiring loom and crimp or solder on the matching receptacle. If you can beg, borrow or steal a decent crimping tool it will improve the reliability of the join immensely, the cheap kits sold at shows and boot fairs, etc. are simply not up to the job. This is getting into the realms of the "anorak" and I don't know whether today's Opel Manta owners are so concerned about originalitiy or have the choice. The earlier cars (70-73) were fitted with headlamps that had quite pronounced curvature to the reflector glass, whereas the later cars (74-75) were fitted with a flat glass lens. The mounting bezels and trim rings are exactly the same between either type, so physically they are interchangeable units. The width of the elctrical terminals and the fact that they will either be loose or contained within a multi-pin plug differs one system from the other. If you are a confident DIY auto electrician it is relatively straight forward to chop and change the end of the wiring loom to suit. Alternatively handy adapter blocks are available if you want to fit H1 reflectors to a wiring loom designed for H4 lamps. A little bit of fiddling around will still be required, but you preserve the original wiring loom. I have a few such adapter blocks left in stock. 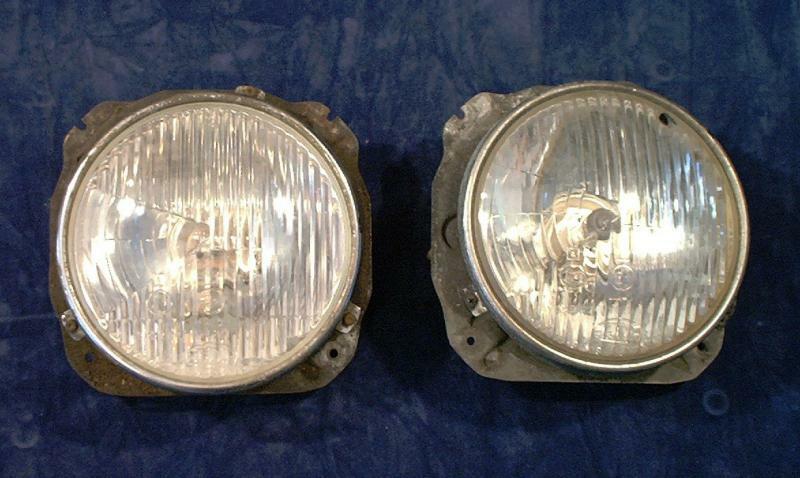 Sealed Beam units were popular with a lot of British cars from the 1960s onwards, these have the advantage that the lamp filament and reflector are a single item, made entirely of glass and vacuum sealed, hence they never rust out. Their disadvantage is that if the filament blows you have to replace the whole unit, although to be fair, even today they are still pretty cheap due to the huge volumes they were produced in. Some have the side lamp filament built in, others have a clear section on the reflector silvering where a lamp can be attached to shine through. Consider from the following list of vehicles for potential compatibility: Ford Cortina Mk3, Hillman Hunter, Humber Scepter, Sunbeam Rapier, Sunbeam Stiletto, Triumph Dolomite, Triumph Vitesse, Vauxhall Magnum, Vauxhall Firenza. This is by no means an exhaustive list, there will be other candidates. If you have any information to add, please use the comments box below or use the contact form to send me details. If you have to replace your headlamp bulbs frequently, use a voltage meter to check the voltage of your Opel's electrics with the engine running at around 1500 RPM. If the voltage reads higher than 13 volts it may be that the voltage regulator circuit in the alternator has failed. Not only will this cause lamps to fail, it will also "cook" the battery and lead to premature failure. Earlier Opel Manta A series ('70-'72) used an external voltage regulator mounted on the inner wing within the engine compartment and connected to the alternator by a short multipin connector. Later Opel Manta A series ('73-'75) had the voltage regulator mounted within the alternator and will require dis assembly to access it. If originality isn't a concern, it should be a simple swap to uprgrade to the later style of alternator, which in my experience is slightly more reliable due to fewer electrical connections in an agressive environment. Lastly, ensure that the engine block is correctly grounded to the chassis, the braided lead is prone to fraying and is sometimes left off after an engine rebuild.